One that I am hoping to get a good grasp of in the next few weeks. The process to which I am referring to is resawing my own wood for projects. I have made a few projects out of reclaimed wood such as my bandsaw boxes and the parting gifts for some coworkers that have left. Now what I am hoping to do is go one step further and make some different projects from these woods that I am able to collect. I mentioned last week that I had built a saw buck well I finally put it to some use and got some pics as well. It worked quite nicely for cutting the log to a good manageable size. I made mone a little differently then Eric did and used some carriage bolts as the pivot points. This seems to work just fine. One the log is a decent size I seal the ends with latex. 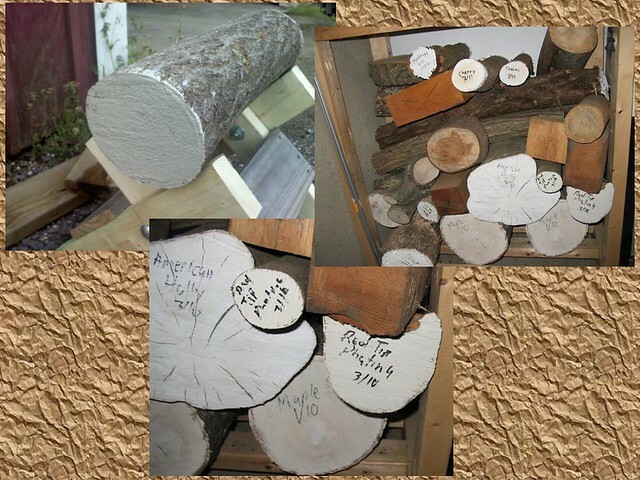 I have been doing this to some wood for a while now and have a few pieces that may be ready for me to use soon. Now I need to of course check the moisture and I do have a meter for that. I am planning to put a new blade on my bandsaw this week and get everything set up. I have not yet decided on a bandsaw sled or just using my jointer to flatten out a log first, which I have done for some of my other projects. Hopefully next week, I will have some boards and maybe even a project to show off. Talk to you all soon and have fun in the shop. Neat stuff. 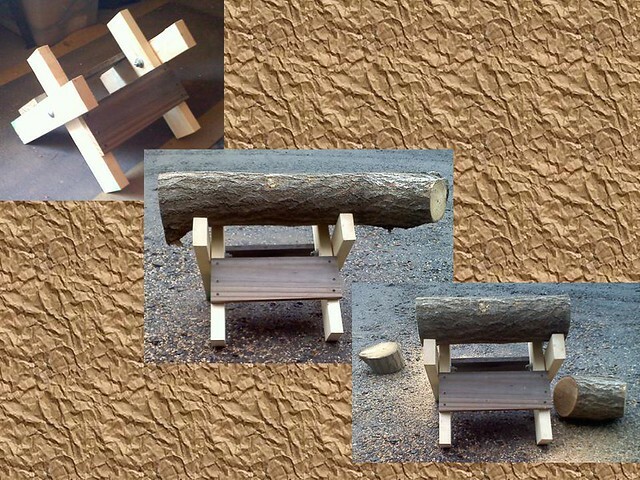 I am thinking of making one of those log holders for my father in law. What is the point of the latex sealer? I see you are getting some checking with your American Holly. I’ve had some of the same problems even though I use end grain sealer, latex paint, or even dip them in wax. A. Holly seems to be the worst. Do you just write the ends off as firewood? RAnce, that is basically what I have been doing as of late. Anything that is checked just gets cut off. It seems a bit wasteful but I figure since Ihave a good source, I am still saving plenty.